For four straight years, the Alabama Crimson Tide and the Clemson Tigers have faced off in the College Football Playoff. Three of them, including tonight, for the National Championship. Typically, this would be an annoyance to most sports fans…but this one feels different. It’s the Ali vs Frazier of college football, our favorite obsession. Sure, for my fandom and that of my fellow Gamecocks fans, this isn’t necessarily fun to watch, but if you remove yourself and your fandom from the mix, then you’ll see how much fun this really is. Nobody is asking you to cheer for anybody, and lord knows I won’t be, but you can enjoy an epic battle. You can enjoy another rematch…the rubber match for the Natty. So yeah, here we go again. Here we go towards an amazing night of heart stopping college football action. He we go with another legendary match-up of the two best teams in the game today. Here we (expletive deleted) go. Personally, I came to a realization sometime in my late-20’s. I realized that to truly enjoy sports, I’m talking all of sports, and the greatness that arises from it, I would have to find a way to be true to myself as a fan while also enjoying games as an unaffiliated spectator. Sure there will still be biased moments and I’m going to continue to loathe anybody that has earned that level of sports hate, but what this has done for me is given me the opportunity to enjoy every second of greatness that has occurred in the last handful of years. It’s even helped me to enjoy the success of my teams that have experienced it and handle their defeats with class. You can watch this game however you’d like and feel free to conference cheer all you want, just know I’ll judge folks for that. I personally am going to continue to enjoy the greatness of this match-up. I’m going to watch a football game. One in which I don’t have a single ounce of rooting interest, as my team lost their low-level bowl game over a week ago…and I’m going to enjoy it no matter who wins. It’s kind of a nice, to be honest. Now as for the game itself, I’m sticking to my guns. I’ve said all year that my opinion was that Clemson was the best team in the country and I’m going to continue to think that until I am proven wrong. Tonight, I may be proven wrong. If I am, oh well, but I’m not going to back down now. I’m picking Clemson to knock of the Crimson Tide for the second time in three years and bring another Natty back to the Upstate of South Carolina. As much as I’ve been told that Alabama is the best team Clemson has faced all year, I have to respond with the same thing…Clemson is the best team Bama has faced all year. Alabama hasn’t seen a team as complete and dominant as Clemson in the daunted SEC, because one doesn’t exist. This truly is a year in which the best two teams are facing off for the championship and that means Clemson is better than every single team that Alabama has lined up against. That doesn’t mean that I think Clemson runs away, cause I don’t. I’m just saying, these teams will both be facing a team unlike any they have seen this season….and that I think Clemson edges out the win again. The big question mark, to me, for Alabama has been their defense and especially their ability to stop the run. Clemson’s rushing attack, led by Travis Etienne is stout. I think Clemson will be able to set up their offense how they like by establishing the run early, giving Trevor Lawrence time to get comfortable on the biggest stage he’s ever seen. Defensively, I still believe Clemson’s defensive front is the best in college football…even without Dexter Lawrence. The secondary for Clemson has had its ups and downs, but I think that if the Clemson defense can shut down any rushing attack from Alabama, that they can control the game enough and out-score the Tide. Tua Tagovailoa will be forced to win this game on his own and while he will undoubtedly put up video game stats in doing so, I don’t think that will be the right formula for Alabama to win this football game. 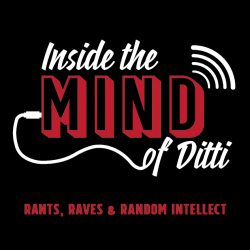 Find me on Twitter (@Ditti33), Facebook (/InsideTheMindOfDitti) or Instagram (dittius33).